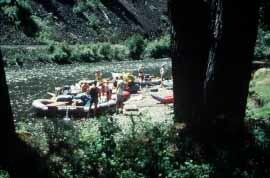 Minam State Recreation Area, located in a forested area along the Wallowa River off Hwy 82, is considered an excellent launching point for whitewater rafting river trips, and is also noted for its steelhead fishing. The park is situated 15.5 miles NE of Elgin in northeastern Oregon. Facilities include 12 primitive campsites with pit toilets. Max RV, 71 feet.